Bring The Excitement Of Horse Racing To Your Game! 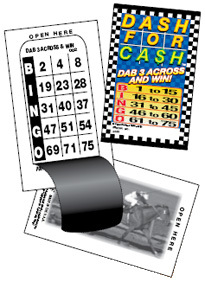 Dash For Cash is a unique ticket where players try to be the first to dab 3 numbers on a horizontal line. Each horizontal line of the ticket has 3 numbers from each horizontal line on a flashboard (3 B’s, 3 I’s, 3 N’s, 3 G’s or 3 O’s). The first player to get a horizontal line wins the grand prize. Second and third place prizes can also be awarded to the players that complete different lines on the ticket. For example, if the first prize is awarded on the B row, the B numbers are disqualified and the remaining numbers are called (I, N, G, & O), until there is a second winner. 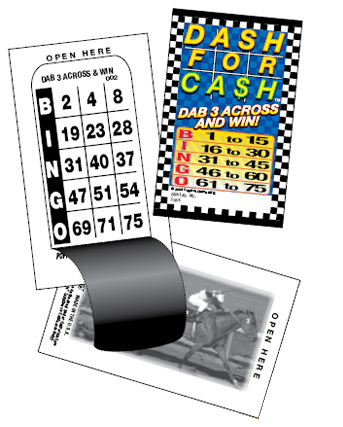 With 450 tickets per deal, Dash For Cash is sure to be a hit with your players.